The T-Touch boasts more functions than you can poke a stick at, is powered by the sun and looks like something you’d actually want to wear. It’s a pretty smart watch. How will the T-Touch, one of the original ‘smart’ watches fare against the new breed of connected devices? The first thing I think of when someone says ‘Tissot’ is T-Touch. Rightly or wrongly the high-tech tool watch is the 162-year-old brand’s most iconic product. It’s certainly their most visionary. The T-Touch collection, with its innovative haptic sapphire crystal was first introduced in 1999. Think about what that means for a minute. In 1999, I was rocking a Nokia 3210 with a complete and utter lack of touchscreen functionality. Great phone, stupendous battery life, but it was button commands all the way, baby. It wasn’t until 2007, a whopping eight years later, that the Apple iPhone normalised the tapping, swiping and pinching gestures that are now part of our daily touchscreen-filled life. Consider all of that and it becomes clear that the T-Touch was way ahead of the curve. 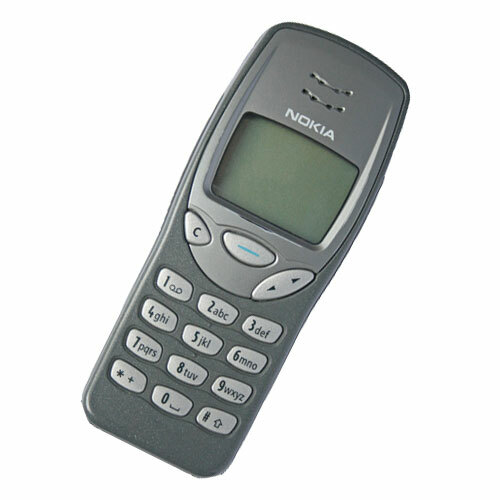 The mighty Nokia 3210. Cutting edge in 1999. If you were looking at the (long) list of the T-Touch’s functions you could be forgiven for assuming its days were numbered against new competitors like the Apple Watch. But that’s far from the case. While both share a large array of features and a touch screen, the Apple Watch is made for urban environments, with easy access to chargers and phone reception. The T-Touch is designed for the other extreme. It’s a self-sustaining, solar-powered, specialised tool geared towards those who find themselves far out in the wilderness. The T-Touch is an example of what’s often referred to as an ‘ABC’ watch – meaning it has altimeter, barometer and compass functionality. It’s a complication combo geared very much to hikers and mountaineers rather than Fitbit runners. 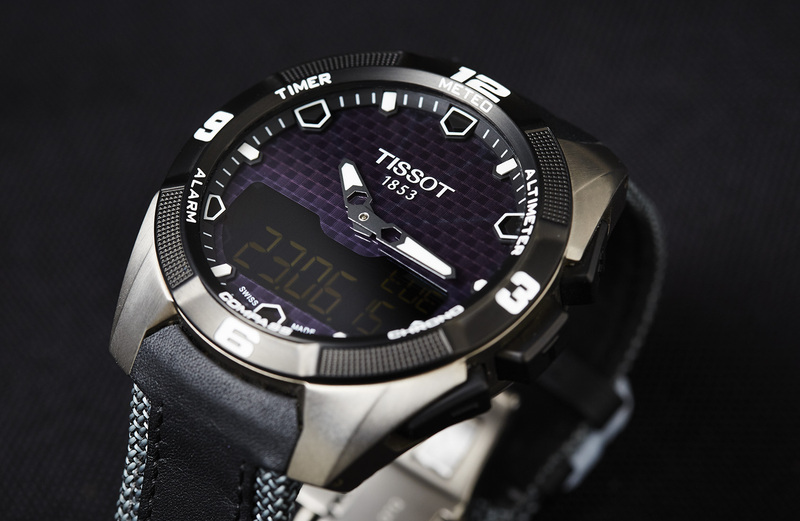 So really the main rivals to the Tissot are watches like the Casio Pro-Trek, the Citizen Eco-Drive, Suunto and some Garmin. These are all ‘serious’ digital watches that offer comparable functions, but in markedly less elegant forms. Few people are going to use the full suite of the T-Touch’s functions as intended, but those that will are going to learn this watch like the back of their hand. And it’s this niche group Tissot cares about the most. The first thing I noticed when I picked up the T-Touch was just how light it was. You expect a 45mm sports watch to have some heft, but the titanium construction, lightweight quartz movement and fabric strap means the watch is a feather on the wrist. Well, maybe not a feather but at 89 grams it’s certainly not weighing anyone down. While it’s not heavy, it is large. The 45mm across isn’t really an issue, but the approximately 55mm from top to bottom might mean people with slender wrists face a bit of overhang – which isn’t the best look. Potential size issues aside, the T-Touch is actually (and I do say this with mild surprise, because it wasn’t my first impression when I saw it in Andrew’s Mountain Dew Commercial video) a good-looking watch. The dial (as you’d expect) is front and centre, and the fixed black bezel displays the main modes. So far, so functional. But what sets the T-Touch apart from all the other ABC watches on the market (except possibly Suunto), is the thought that has gone into design. The lugs flare out into the case, contrasting with the black strap, bezel and pushers – giving the watch a distinctive ‘X’ motif that Dr Charles Xavier would approve of. The T-Touch doesn’t scream ‘extreme’ and for those people wanting to wear this watch when they’re not scaling mountains, this is a good thing. I do have one minor issue with the design. The pushers are partially shrouded by the case, which is sensible. But there is a fairly sizable gap (of a few millimetres) between the pusher and the case that looks like an excellent place for dirt and grime to get lodged and potentially gum up the works. It seems like an odd oversight on a watch intended for action. The dial is the heart and soul of this watch. And for such a clean design there’s a lot going behind the scenes. It has a big empty space with stubby indices applied to the outer chapter ring and broad hands. But take a closer look and the dial is divided neatly in half. The top is comprised of the solar cells that, close up, look almost like woven carbon fibre. The bottom half of the dial is the inverted LCD display. This is a smart move by Tissot because from a distance the watch doesn’t scream ana-digi. It just looks like a black dial. The bezel is divided into eight stylised sections with numerals at 12, 3, 6, and 9. The inner part of the bezel indicates where you need to tap to access the core functions. And of course the crystal is the tactile sapphire that gives the T-Touch its name. Where to start? Well, after a few minutes of fiddling with the functions (every time I hit that compass feature I get an irrational joy watching the hands turn into a compass needle) I started with the 21 page manual, which turned into something of a bible for me over the week I wore the watch. While the basics of activating the functions are pretty intuitive, for me the biggest stumbling block was getting used to the crown/pusher interface for adjusting/setting the various functions. Luckily that’s not something you need to do on a regular basis. I’m not going to go into too much detail about the many (many) functions of the watch, as that could get boring real quick. But I will talk about the functionality. The system of pushing the crown to activate the touch screen is easy, and the flashing ‘T-Touch’ logo on the LCD to indicate when the screen is live is smart. As is the hands moving out of the way of the LCD display when the alarm or chrono functions are activated. The speed of the hands whirring into position is impressive and much improved from earlier generations. I can only assume that the watch can handle the extra power required for this sort of work thanks to the solar cells. Aside from the functions outlined on the dial (chrono and alarm being most useful day to day) the ability to constantly display a second time zone, check the battery levels and briefly illuminate the LCD are seriously handy. If it’s been a while since you’ve worn a feature-packed digital watch, there’s a steep learning curve, but the pay-off is a watch packed with genuinely useful features. You may find yourself just activating them on the tram for fun. Or that could just be me. 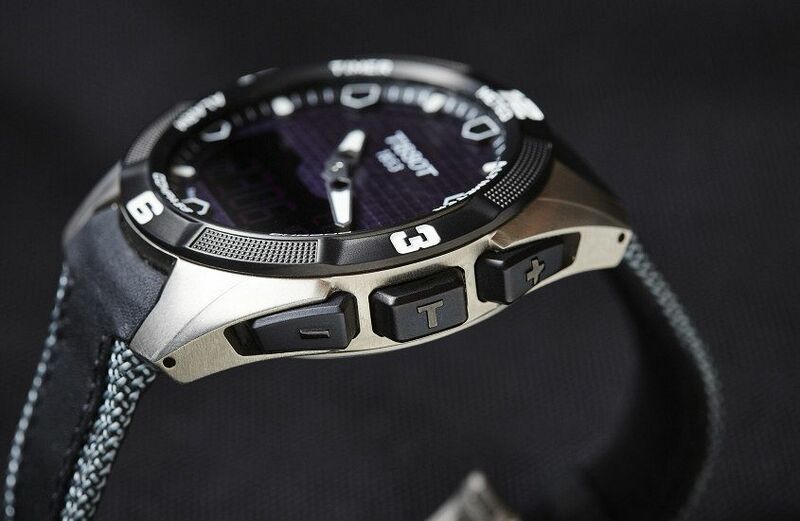 The T-Touch comes on a range of strap options, including a very solid titanium bracelet. But the model I reviewed came on a fabric strap, made from a mix of woven nylon with leather details. It looks good, and more importantly, works with the watch and is comfortable to wear. I expected a standard tang buckle so was slightly surprised by the double-fold titanium deployant. It’s a nice touch that adds some Swiss quality to the whole T-Touch experience. To be honest, I’m not Tissot’s target market for this watch. I don’t climb mountains (or even steep hills) and I’ve never been the type of guy who’s into electronic gadgets. So strapping on the T-Touch for the first time I wasn’t sure how I’d find it. But one week on, I’m sold. The watch is so light and comfortable you forget it’s there. But it’s also solid enough that if you smack it into a brick wall (because you forgot you were wearing it), the wall will probably fare worse than the watch. It also has enough mainstream appeal that I can wear it to the office without looking like a wannabe NavySEAL. And, best of all, the sense of uninterested disconnect I usually find with battery powered watches (I know, I’m a snob #sorrynotsorry) was completely offset by the sheer amount of stuff this watch can do. I can forgive batteries in a watch if a: I never need to change them, b: the watch can tell me how high above sea level I am and c: it can turn into a compass. Sure, a Casio Pro-Trek or Apple Watch can offer you similar functionality, and both can come in cheaper than the $1,325 retail of the T-Touch Expert Solar. But they’re both compromised watches. 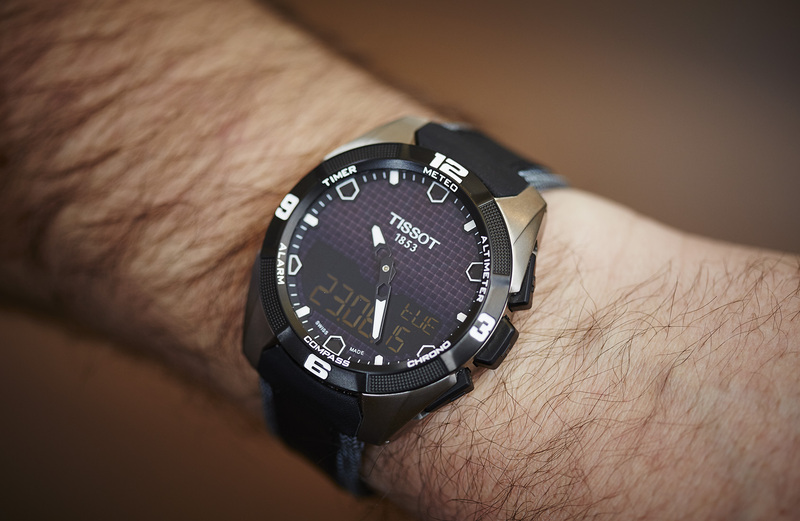 The Tissot looks good in a range of situations (unlike the Casio) and has the battery life, robustness and proven track record to actually be relied on when you’re out adventuring (unlike the Apple Watch). 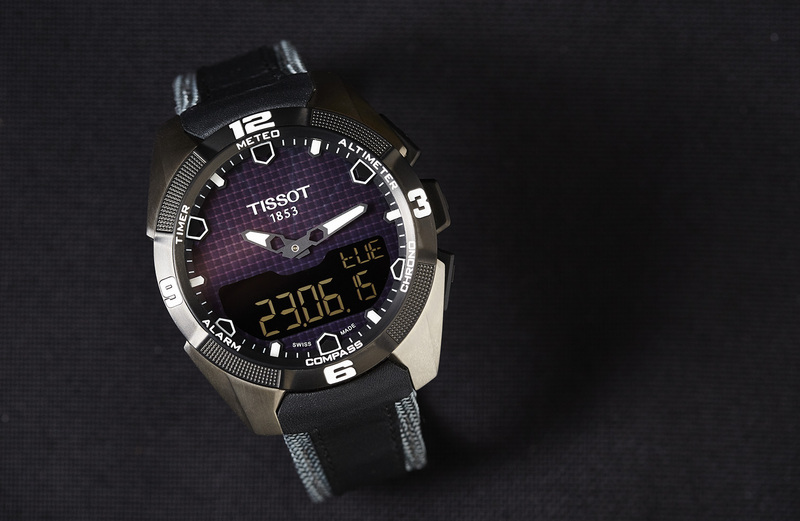 If you need a function-heavy digital watch that looks good and is built to last, the Tissot T-Touch is the leader of the pack. Want to check out my compass? How does the T-Touch stack up against its ABC competitors like the Pro-Trek or Suunto? People who want a hiking watch that doesn’t look like a hiking watch. Two small things. Lose the dirt traps near the pushers and beef up the lume. Otherwise we’re all good. This configuration of the T-Touch retails for $1,325. Images by Jason Reekie. Feature image by Kristian Dowling.